A group of young space travelers can't wait for their pizza party later, but how many hours away is dinner? What are hours anyway? 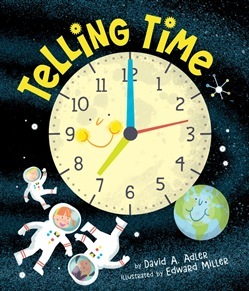 Readers follow along as a loveable crew of kid astronauts and their Martain friends go about their daily routine, exploring the differences between seconds, minutes, and hours; what A.M. and P.M. mean; and how to tell time on both digital and analog clocks. Ten seconds to liftoff! Are you ready? Veteran children's nonfiction author David Adler incorporates math concepts, such as addition and subtraction, into this fun narrative with problem-solving exercises for readers to tackle at their own pace. Edward Miller's vibrant cartoon art depicts the happy group of friends embarking on space walks, working together on projects, and settling in for bed. The sixteenth book in Alder and Miller's math picture book series, this title is perfect for enthusiastic learners or kids who may need a little extra support in mastering this essential life skill. A glossary explains time zones, daylight savings time, and more. An out-of-this-world STEM book. Acquista Telling Time in Epub: dopo aver letto l’ebook Telling Time di David A. Adler ti invitiamo a lasciarci una Recensione qui sotto: sarà utile agli utenti che non abbiano ancora letto questo libro e che vogliano avere delle opinioni altrui. L’opinione su di un libro è molto soggettiva e per questo leggere eventuali recensioni negative non ci dovrà frenare dall’acquisto, anzi dovrà spingerci ad acquistare il libro in fretta per poter dire la nostra ed eventualmente smentire quanto commentato da altri, contribuendo ad arricchire più possibile i commenti e dare sempre più spunti di confronto al pubblico online.